About the Game : Squad – Communicate. Coordinate. Conquer. Squad is a large-scale online multiplayer first-person shooter that aims to capture combat realism through communication and teamplay. The battlefield of Squad is built around organized teams using both the environment and the assets available within the game to wage a tactical battle against an opposing team. From role organization to base building to vehicle mechanics, teamwork amplifies the effectiveness of the tools at your disposal. Supported by intuitive positional VOIP and navigation systems players will be able to maintain situational awareness and seamlessly interact with others. Dedicated chain of command channels and localised voice will be an effective tool for communication and organization. Squad seeks to establish a culture of camaraderie that is unparalleled in competitive multiplayer shooters. This is a game where you can work together and coordinate with your team: players from around the world, often that you just met. Squad will support up to 100 players in competitive multiplayer. This broad scope serves to immerse the player into a rich battle environment filled with challenges and opportunities. With teams of sufficient size, some players can perform supporting roles while leaving enough front-line combatants to provide fun and challenging gameplay across the full expanse of the battlefield. A wide variety of support vehicles and aircraft will be included. Tanks and close support helicopters will spearhead a team’s assault into enemy lines while transport helicopters and APCs will provide much needed logistics and transportation support. At the heart of Squad is our desire to let the player drive gameplay and define the objectives. Commanders and squad leaders will be given the ability to shape the battlefield through construction of defensive and offensive fortifications as well as control of battlefield planning and supplemental combined arms assets. 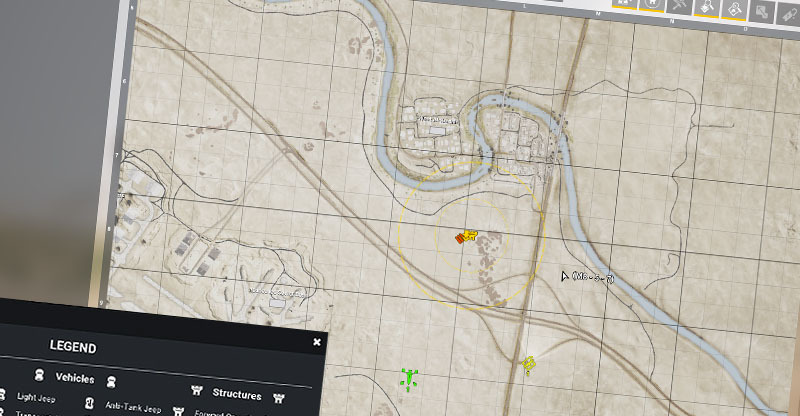 Coupled with this, spawn dynamics will be affected by occupation of territories and level of supply each objective is receiving. Organized control of the battlefield will ensure a properly supported supply structure and pave the way for a strategic victory.